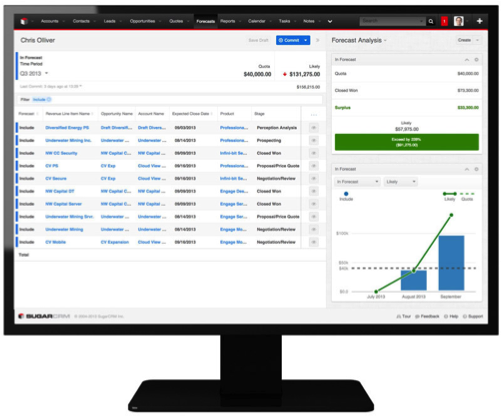 SugarCRM offers Genix customers an innovative and affordable CRM solution that is at the forefront of the CRM industry. Key features have been integrated into the iBPMS and customised to integrate with Genix’s other product offerings. Sugar extends traditional CRM boundaries into social and mobile solutions and the company is recognised by leading market analysts as “visionary”. The software is an immersive, engaging and intuitive open platform with the flexibility to be integrated into existing business applications, processes and daily tasks. It is offered as PaaS, SaaS as part of Genix solutions or as a straight forward Sugar rollout it is available on public or private clouds and can be extended to the public cloud with the security of existing firewalls and user management systems. Customers continue to have full access and ownership of their databases and the solution can be enhanced and modified if required. With deployments to over 1.5 million individuals in 120 countries and 26 languages, Genix recognised Sugar as stable and like-minded innovators able to meet our customer needs without the risk of long lead times and difficult integrations. 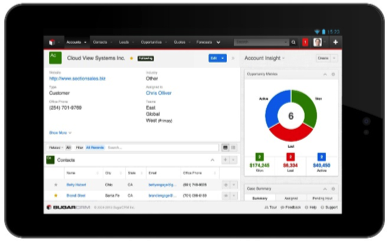 360-Degree View of Customers: The platform provides information on what matters to accounts and contacts, when it matters including a 360-degree contact activity history across the extended relationship lifecycle. Users have a better understanding of what matters to a contact and when to engage with smarter account intelligence based on cross-channel and social media activity. Expert Collaboration: Sugar provides access to resources when they are needed including connections in real time with experts across the organisation to support collaboration to accelerate every stage of the relationship management cycle. Social Selling: Sugar allows users to leverage relationships and social networks to expand contact management opportunities. It allows users to track trends across social sites and respond directly from the CRM system. Mobile: Sugar allows users to access leads and opportunities, meetings or calls across any mobile device and allows users to move seamlessly between a mobile and desktop app to stay on top of every relationship. Real Time Pipeline Management: Sugar supports the tracking of early indicators and changes affecting the pipeline in order to stay ahead of forecasts. 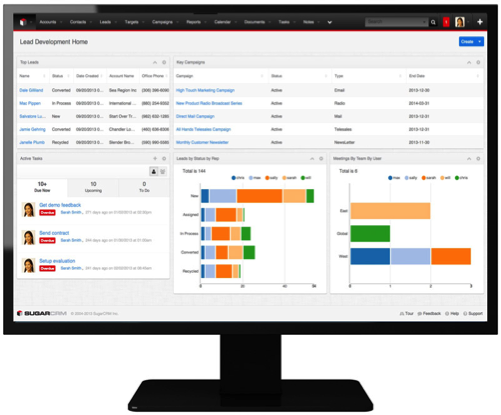 This allows users to spend time where it counts, and meet relationship management objectives. Workflow and Approvals: Sugar automates day-to-day tasks and automatically drives relationship change alerts, routes leads to teams, communicates with prospects, assigns opportunities, and monitors account activity. Email, Calendar, and File Management: Sugar allows users to leverage existing applications with Sugar’s built-in email integration for Microsoft Outlook, Gmail, IBM Lotus Notes, Yahoo! Mail, and IMAP based email servers. Sugar also comes with a wide range of collaboration integrations to Google apps (Google Docs, Google Calendar, Google Contacts) and Box.com. 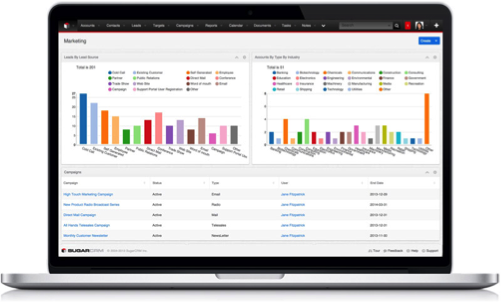 Sales Analytics: Sugar’s customisable intelligence panes, reporting, and dashboards provide users with real-time information about activity pipelines, progress against quotas, key opportunities and account activity, and rep performance. Sugar reports can be personalised for every user, on every screen, so the users always have the insights they need to drive results. Personalised Marketing: Sugar’s design ensures that users always have the information they need, in context, to understand customers, create innovative messaging campaigns, and measure their effectiveness. Prospect and Customer Targeting: The platform supports the personalisation of messages by identifying key segments of targets and prospects with Sugar’s reporting engine. This leverages information captured from multiple channels to focus messaging efforts on the best prospects in order to improve customer engagement. Multi-Channel Campaigns: Sugar supports tracking of both digital (email and newsletter) and traditional (trade shows, events, radio ads, etc.) campaigns. Sugar also enables users to easily incorporate social promotions and apps into their campaign mix, so users can track the effectiveness of all channel initiatives and messages in a single system. Multi-Touch Campaigns: The platform leverages information on prospects and customer events and activities across communities to identify relevant, timely opportunities to engage customers and leads. This allows users to drive leads based on their activity and interest levels across channels. Lead Tracking: The platform effortlessly places actionable insight in the hands of the relationship management organisation, supports the capture of feedback and ensures only high quality leads are actioned and the coordination of processes for more timely, multi-touch follow up, and the monitoring of activities. Closed Loop Intelligence: This allows users to understand which channels, messages, campaigns, leads, and accounts resulted in the highest lead conversions and opportunity wins. Sugar’s campaign-to-deal reporting tracks campaign investment and impact. Social Service: Supports organisations in their efforts to track what customers are saying about the organisation across social media channels. It provides access to up to the minute information about key topics raised by the customer base and allows issues to be routed to a single agent queue. Expert Collaboration: Sugar allows users to connect to and collaborate with experts in real time across the extended support and technical organisation. Users can get rapid access to answers, share documents and videos, and collaborate on best practices across the globe in real time. Inbound Routing and Workflow Management: Sugar allows users to respond faster by routing calls and emails to the right service representative. Users can address issues proactively and eliminate escalations by monitoring and prioritising customer activity across channels. Knowledge Base: Sugar allows users to deliver smarter service by providing accurate, user-ranked content across the knowledge base as well as Google, business and technical communities, and social media channels. 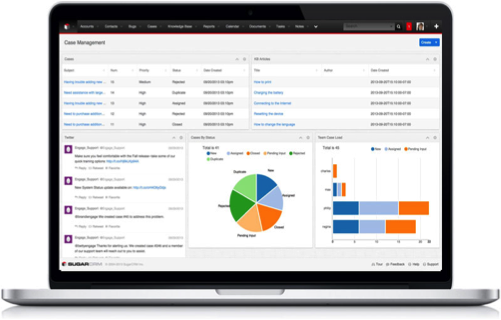 It empowers every customer to get rapid access to the answers they need quickly. Self-Service: The platform allows organisations to empower customers to leverage the collective ecosystem to find solutions and get updates automatically. Customers can post questions on Sugar’s cross-device, self-service Portal to get peer and expert advice for faster support. 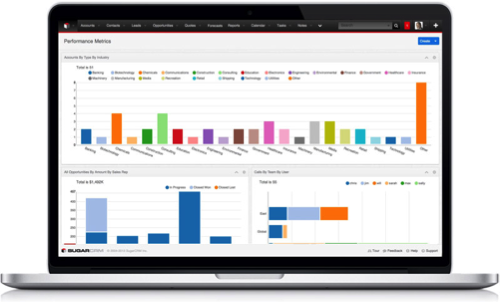 Support & Service Analytics: Sugar reporting and dashboards provide real-time information about customer history, product usage, and hot topics. It tracks responsiveness and time to resolution across accounts, teams, and departments, common problems and root causes as well as overall customer satisfaction.